Merging an innovative slider design with an impressive feature set, the RIZR Z3 marks Motorola's first venture into the slider-style GSM market. Stylishly wrapped in a package for fashion conscious consumers looking for style and portability, the RIZR is packed with all the latest mobile technology, including a 2-megapixel camera, stereo Bluetooth compatibility, an advanced music player, EDGE high-speed data capability, and more. The RIZR Z3 takes the standard slider-style form factor to the next level with a sleek profile, and a unique, spring assisted opening design. 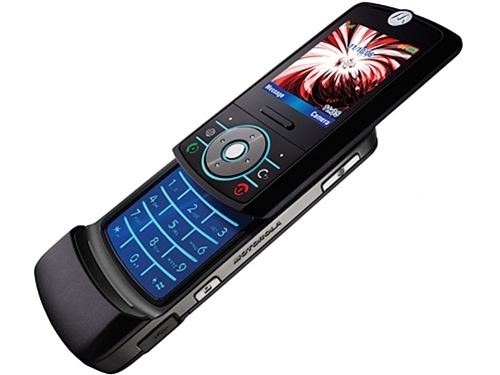 It also takes familiar style cues from the wildly popular RAZR flip-phone. A large 176 x 220 color display with 262,000 colors dominates the top of the slider. The 2-megapixel camera lens is discreetly housed on the upper backside of the phone, safely tucked away until ready for use. Up/down buttons are placed on the left side for volume control while a voice button on the right side of the unit allows you to enter voice memos and create voice dialing profiles. Most of the phone's features and on-screen menus are controlled by a five-way center button on the handset's backlit control pad, which is precision cut from a single sheet of nickel-plated copper alloy. A charging port and USB data cable port is placed on the bottom of the phone. Lastly, a memory card slot is included, allowing you to augment the RIZR's 20 MB of built-in memory.